The client’s home was a large, semi-detached mid-Victorian townhouse, which retained many of its original features. At one end of the kitchen there was an original Victorian fireplace, which was restored and then became the focal point of an informal dining area at the entrance to the kitchen. The room itself, although long and narrow, had plenty of natural light with windows along one side. While wanting a modern, highly functional kitchen, the design had to work in a period building with many original features. 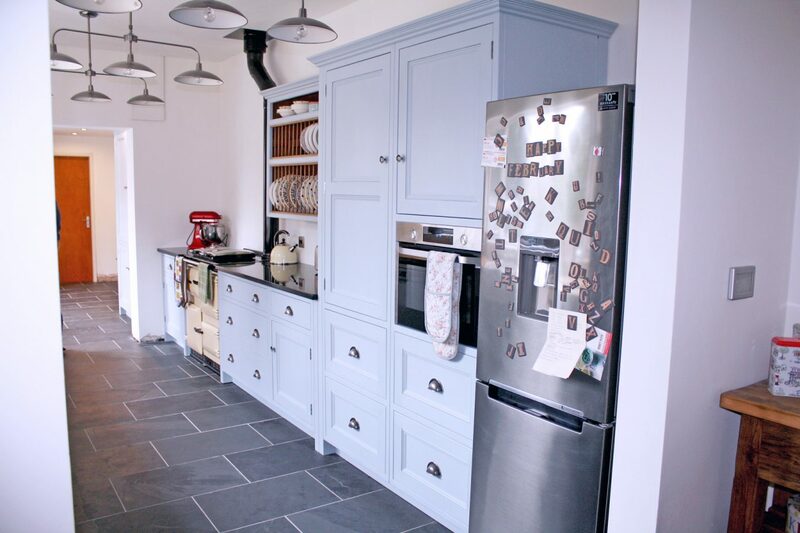 The client wanted a kitchen which was as efficient as possible with the space available, and so wanted to incorporate a larder and more drawers than cupboards. 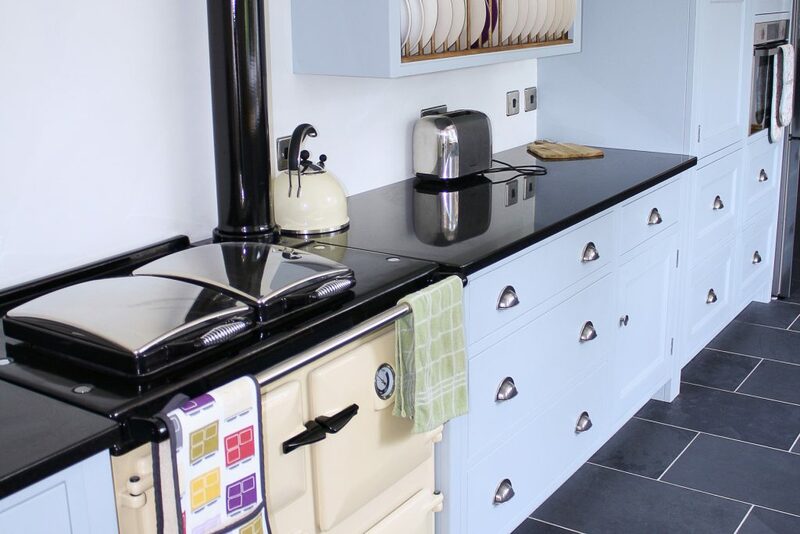 A Rayburn was a must-have in the design, but additional cooking space was required. The flooring was to be a dark slate, so the colours had to complement dark tones without making the whole room feel small. Plenty of drawers rather than cupboards: tall pantry cupboards for foods, large plate rack, modern twist on a traditional-style sink. Following discussions with the customer, the Mudd & Co team visited the Victorian property to measure the space available and to ensure all questions had been covered. Our in-house designers then created a line drawing of the available space, in addition to a visual CAD representation of the planned bespoke kitchen as agreed with the customer. This was then sent to the customer for approval. On customer sign off, work orders and design drafts were passed to the workshop to meticulously handcraft the kitchen to spec. Lead time on this project was approximately 4 weeks from the sign off of the visual plans. 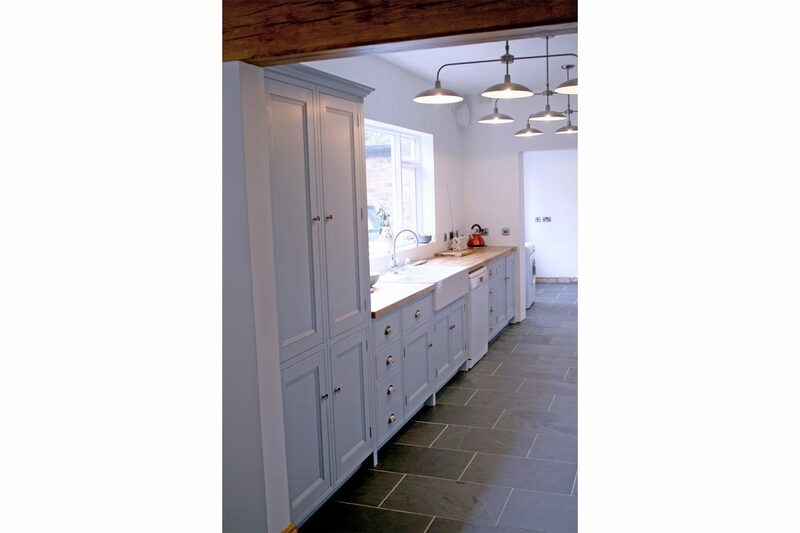 Delivery was made by Mudd & Co, whilst the kitchen was installed by the customer’s builders who were finishing the brick work and window installation at the property.